Patch 1.0.4 also adds FOV sliders and a new endgame mission type. One of Anthem's biggest sins, for me, was having to sit through a loading screen just to access the Forge, where I could change my javelin's weapons and equipment. Sure, it was a quick load—less than a second or two—but this is a loot shooter. I want to see my loot whenever I damn well please, and having to walk to a specific location in Fort Tarsis and sit through a loading screen just to access it was aggravating. So thank god BioWare finally fixed that in its latest patch. Available now, patch 1.0.4 includes several great quality of life updates, tweaks to Anthem's ongoing issues with loot, and some new endgame modes to hopefully mix up that grind. It's not enough to make me like Anthem, but it's a good start. The biggest features added in 1.0.4 is new Legendary Missions and Elysian Caches. 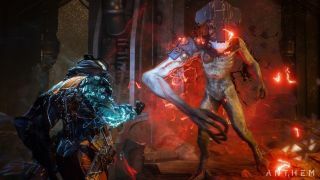 The former allows players to replay one of Anthem's main story missions at higher difficulty missions. Each day, one randomly selected story mission will be available and players can complete it as many times as they like, hopefully earning some nice gear in the process. Elysian Caches are a new way to earn cosmetic items after completing Strongholds. By completing daily challenges, you earn keys that can be used to unlock these Caches, which grant vanity items and crafting materials. BioWare says there are over 67 of these new items to earn, including poses, emotes, and vinyls. Players are a little miffed, though, that different cosmetic armors and helmets won't be found in these chests. At least you can't earn duplicates. Patch 1.0.4 also adds a ton of smaller features, too. FOV sliders are in and RTX users can use DLSS, and loot drop rates have been buffed in Strongholds and higher difficulty missions. You can see the full patch notes here, if you want to pore over every fix. The update is available now.